As we all know Christmas is around the corner and we would love to collate some lovely Christmas articles for you. We already have lots of Ornament Patterns like Peppermint, Candycane, Baubles etc. So today we thought about a Gift or a Present. So, this one will be a Free Easy Crochet Patterns for Christmas Present Ornaments. 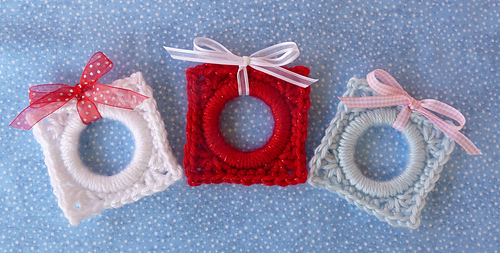 Christmas Present Ring Ornament by Doni Speigle is a cute ornament made using Worsted weight yarn and a 4.5mm crochet hook. The pattern is available as Free Ravelry Download. 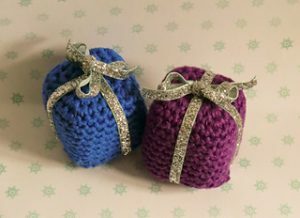 Mini Christmas presents by Liz Ward is a beautiful amigurumi one made using DK weight yarn and a 3.5mm crochet hook. 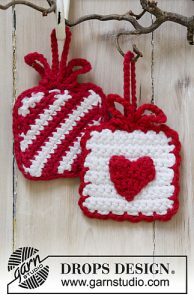 Hanging Gifts by DROPS design are such cuties and made using Aran weight yarn and a 4.00mm crochet hook. 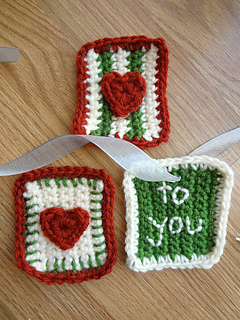 Stitchy Gift Tags by Fiber Flux / Jennifer Dickerson is a lovely little present made using a 5.00mm crochet hook. These can be used as ornaments. 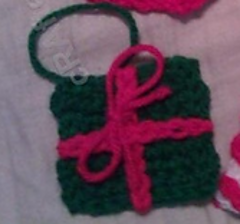 Christmas Present Ornament by Niki Wyre is a lovely one made using Worsted weight yarn and a 5.00mm crochet hook. So these were some lovely Christmas Present Ornaments.